Fire service officials said it took an hour to free the man after they were called to a house in Wolverhampton city, reports the BBC. Fire service officials said it took an hour to free the man. 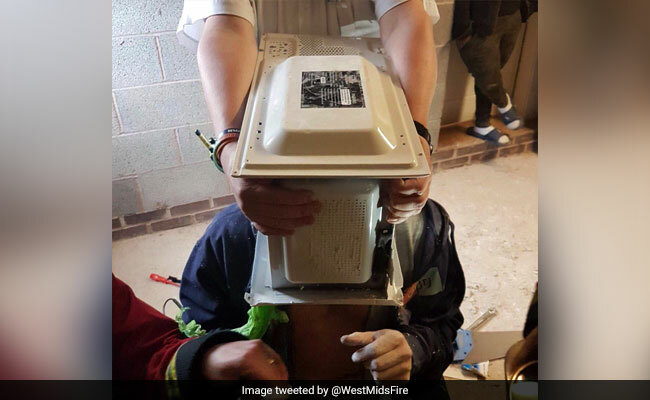 London: A British internet "prankster" had to be freed by firefighters after cementing his head inside a microwave oven, the media reported. Friends had managed to feed an air tube into the 22-year-old's mouth to help him breathe, the service said. A senior official said the man "could quite easily have suffocated or have been seriously injured". "He and a group of friends had mixed seven bags of Polyfilla (cement) which they then poured around his head, which was protected by a plastic bag inside the microwave. "The oven was being used as a mould and wasn't plugged in. The mixture quickly set hard and, by the time we were called, they'd already been trying to free him for an hour and a half. "It took us nearly an hour to free him," the official added.